Do you love al fresco dining, but wonder how to bring your garden or terrace to the next level, beyond just choosing an outdoor dining set? Think everything from the right flooring to great outdoor dining furniture and sumptuous accessories and atmospheric lighting. Attention to detail is key, so take inspiration from our design tips (as well as our practical advice, obvs). If you are creating an outdoor dining area as part of a bigger garden overhaul, find out how to plan, design and cost your garden transformation. An outdoor dining area will need flooring that can support lots of furniture and your barbecue, so choose a practical, durable surface that is hard (to prevent your furniture sinking into the ground), and even and smooth (to prevent accidents). Ideally, your outdoor flooring will mimic that of the flooring indoors in style, colour and finish for that perfect indoor-outdoor blend: decking is a great option if you have wooden kitchen flooring, but look at paving options if you have floor tiles. Find out how to design the best garden deck in our guide. This decking area is supporting a barbecue and dining set from John Lewis. Every garden needs some good outdoor storage, but especially a garden that doubles up as a dining space or outdoor kitchen. If your outdoor dining area is covered, you can keep all your utensils and table linens clean and tidy in kitchen trolley, boxes, and crates outside; otherwise, make space with clever shed storage. We have plenty more space saving garden storage ideas. A selection of outdoor storage options is available at Ikea. Music makes any dinner party better, so why not have it on when dining outdoors, too? You can, of course, simply have sound coming from the indoors, but for convenience's sake (think changing a song quickly or controlling volume), invest in an outdoor speaker. The Aglow Bluetooth Outdoor Speaker from Kreafunk is waterproof and doubles up as an LED lantern. Available at Cuckooland. The San Juan Outdoor Rug by Fab Hab is waterproof and reversible – and visually striking. Available at Cuckooland. One of the pleasures of indoor dining is crisp and fresh table linen – so why not have the same level of detail outdoors? Choose natural, luxurious fabrics such as cotton and linen for a slightly rustic, cosy look and feel, but go for natural finishes and colours, as they won't fade as obviously as bright colours. 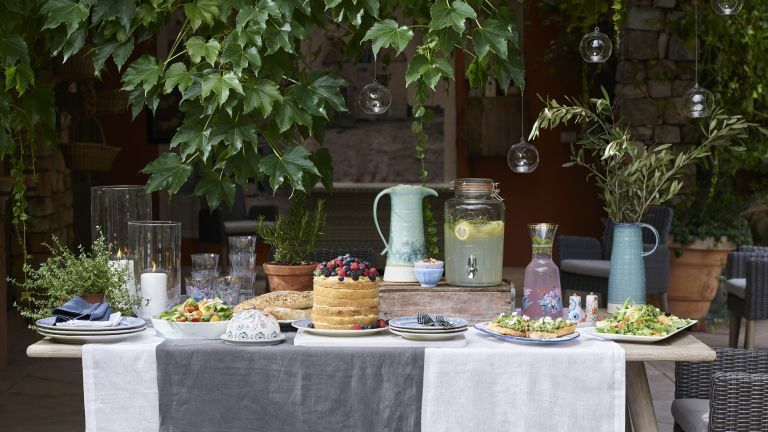 In this outdoor dining space, The Eden Outdoor Dining set has been covered with cotton and linen table linen from John Lewis. If your kitchen is not right next to your garden dining area, transporting heavy dishes between the inside and outside may be a challenge (especially if you are cooking for a large group). So, why not have a little kitchen dedicated to al fresco cooking right where you will be having dinner? Add a few plant pots, including herbs, and you have a self-sufficient outdoor dining area complete with a mini kitchen garden. Get advice on how to design an outdoor kitchen. This outdoor dining area has been created with the Applaro range from Ikea. This outdoor dining area features a garden parasol from Ikea. We have more brilliantly boho design ideas for you to browse. We love the elegance of the Monaco six-seater Dining table from Neptune. The Florence Stacking Armchair from Bridgman is smart and made from aluminium, making it lightweight and easy to move around.